Well, measurements are the key to chicken couture and frankly, we gotta do more measuring. I went for a “turtleneck cape style” – combining what I thought were the best elements of the “chicken sweater tube” and the strange zipper suits the other pro chicken models were in. Essentially I took a felted/shrunken turtleneck neck from a sweater, and stitched a bits-of-felted-sweater cape to it. 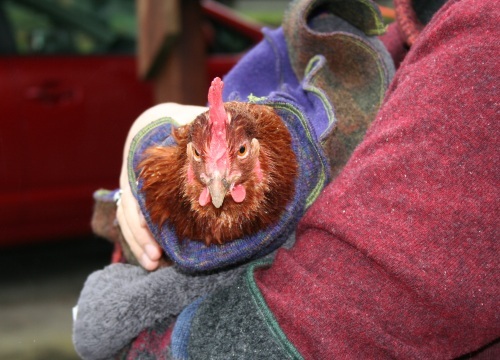 First we picked the smallest, amenable chicken – Shy Chicken. She came running out and Jason snagged her, then I wrapped her in a towel and we got the turtleneck over her head (with its attached cape). She squirmed a lot. Here you can see what the “turtleneck” part looked like close up. You can see the fatal flaw in the design in the picture above- the turtleneck is bigger than her neck and is falling on her body more like the “sweater tube” from a previous blog post. That meant that the cape – which was not a true half-circle or a closed tube, but had a pie-wedge open in the front for more flexibility – was falling more along the fatter part of her body than resting on top of the place where her neck begins. 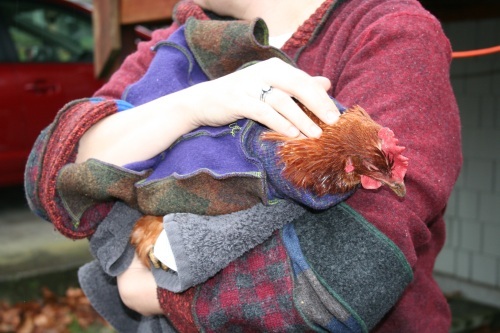 Here’s Shy looking elegant but constrained in her chicken sweater corset so you see what I mean. After a few seconds of struggling to get her wings out, she gave up and immediately swooped on a worm. We felt bad however and took her out of the garment once she’d gulped down the worm. I tossed the garment into the trash. Next up might be “tube with wing slits.” But, I’m not sure. Mother Nature intended chickens to run naked and we may be messing with vital supernatural forces here if we taunt the powers that be too much with chicken sweaters. 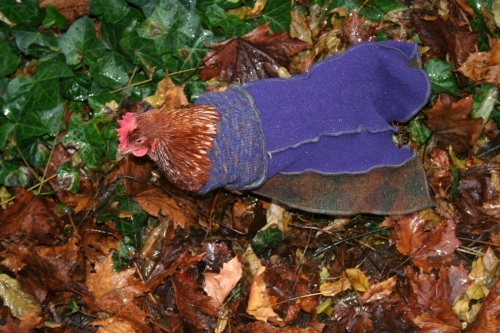 This entry was posted in Uncategorized and tagged arts and crafts, chicken clothing, Chicken Culture. Bookmark the permalink.